Dr. Matthew P. Reed, Don B. Chaffin Collegiate Research Professor and head of the Biosciences Group of the University of Michigan Transportation Research Institute, has won the SAE International Arnold W. Siegel International Transportation Safety Award. At the University of Michigan College of Engineering, Dr. Reed also has appointments in Integrative Systems and Design, where he is acting director of the Design Science program, and Industrial and Operations Engineering, leading the Human Motion Simulation Laboratory in the Center for Ergonomics. Dr. Matthew P. Reed, Don B. Chaffin Collegiate Research Professor and head of the Biosciences Group of the University of Michigan Transportation Research Institute, has won the SAE International Arnold W. Siegel International Transportation Safety Award. 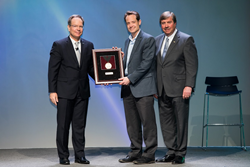 The award was presented at the annual Awards Ceremony during the SAE International WCX World Congress Experience, recently held in Detroit. The award recognizes individuals whose accomplishments include outstanding international research, innovation and contributions to crash injury protection, crash injury biomechanics and crash injury design for all mobility vehicles: land, air, sea and space. Arnold W. Siegel, who was an SAE Fellow and SAE Medal of Honor Recipient, and his wife Steffi generously provided the funding to establish this award. At the University of Michigan College of Engineering, Dr. Reed also has appointments in Integrative Systems and Design, where he is acting director of the Design Science program, and Industrial and Operations Engineering, leading the Human Motion Simulation Laboratory in the Center for Ergonomics. Dr. Reed’s research focuses on vehicle safety, engineering anthropometry, and ergonomics. He has conducted research on occupant restraint systems optimization, crash dummy development, and computational modeling of vehicle occupants. He has developed tools for the ergonomic design of vehicle interiors, including widely used posture prediction and motion simulation algorithms for use with digital human figure models.